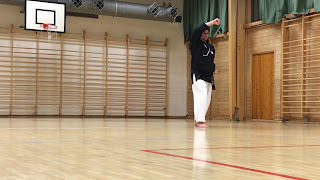 In my last part of the series I promised I would start looking more into the form(s) themselves, and If you have read Part One (click here to get there), or Part 2 (click here to go to part 2) you will allready know that Funakoshi changed the teaching order and why he did it. You will also know that all the Kwan that I have found documentation on the Pyungahn series has taught them in the Funakoshi order. So what I have done here is to read the 1922, 1935 and 1958 book of Funakoshi where he describes or demonstrates this form. I made a video performance based on the form, and then I used snapshots of that video to document the form here. So you will get both video, pictures and text in this post (a little something for everyone). 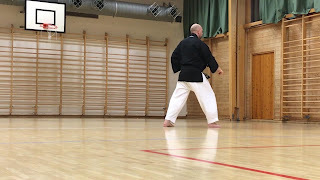 this part will focus on the first form in the Funakoshi teaching order; Pyungahn Chudan Hyung. In Okinawan Karate, or just about all Karate styles apart from Shotokan this would be Pinan Nidan (2), but for us and Shotokan it will be the first form. First up here is the video of the form. 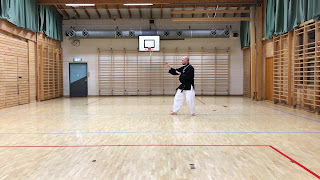 Keep in mind that I decided to keep the Kukki-Taekwondo chambers. 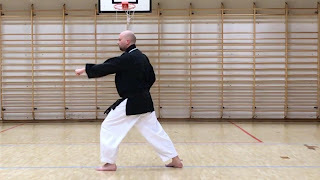 That means for the most part that the form is pretty much like Funakoshi documented it, except for the ending knife hand guarding blocks. 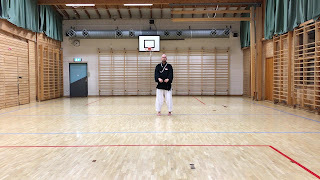 I have used the "Taekwondo Chamber" there. I suspect that we will see several differences between the different books dealing with the same form, but for the very first form there werent actually that many differences to take note off. The 1922 book can be found on Amazon (click https://amzn.to/2SKjWaB and it is an affiliated link). The 1935 book can be found by clicking here: https://amzn.to/2RwVGau (amazon affiliated link) The 1958 book can be found by clicking: https://amzn.to/2DkAZfc (Also an affiliated link). 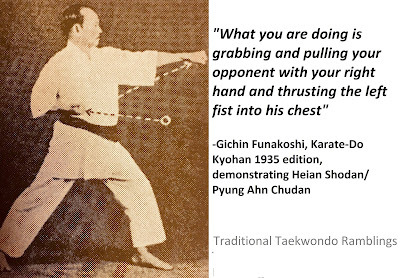 The 1922 book is very spartan in its descriptions of Pinan Nidan. 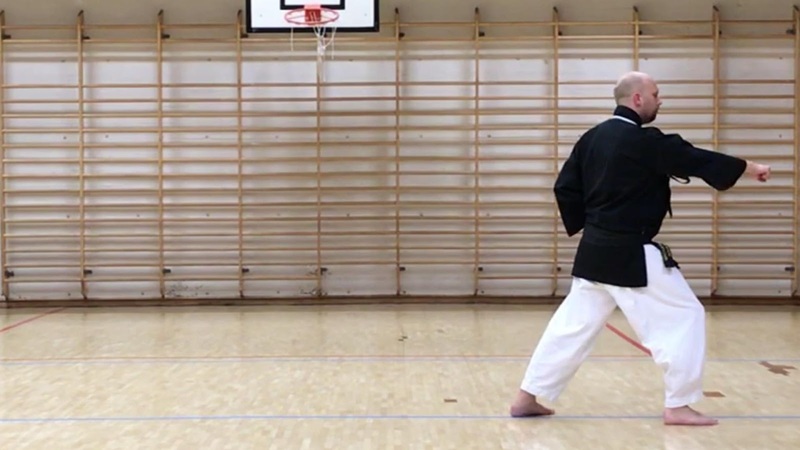 At this time Funakoshi had yet to change the name and to reverse the order of the first two forms, so in this book Pyungahn Chudan is Pinan Nidan. There are no Kihap points in this book on the form, Kihap is not mentioned in the text regarding this form at all. The movements are described pretty open-ended; i.e. thrust forward with your right hand (no description of the striking surface, nor height, nor target). The stances used is also often not specified. Another thing is that there are no real applications given within the form either. 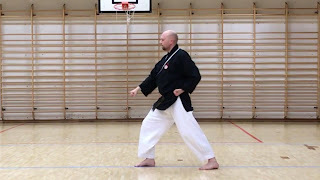 The closest thing we get is: ".... take the stance of defending from an upper level attack to the right" and so on. Another thing of note, and this could be a translation error, but move #4 is in both video examples clearly a downward hammer fist strike (or what we would call it today), but in the 1922 version Gichin Funakoshi writes on this movement: ".... and punch horixontally with the shoulder with the knuckles pointing downwards". Would this mean that at this time you ended up with a downward back fist strike? Are we to take it literally as a punch horizontally with the shoulder to be a straight trajectory and not a downwards one like we see today and in later editions dealing with the same form? The 1935 book reads much more as a modern day textbook, and has each movement illustrated with pictures, making everything a lot more clear as to what is really going on. In this book they are called Heian, and the teaching order for the first two forms are reversed from the original order, so between 1922 and 1935 Funakoshi had changed the name and teaching order. In this book we get Kihap points specified within the form. As this was the textbook of the founders of several of the Kwan that would later form Taekwondo I think we can safely assume that the originators of later Korean Poomsae (and Tul) knew about the reason why we pull our hands back to the hip in forms. 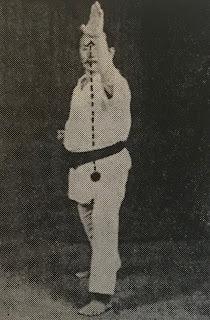 The 1958 book was published after Funakoshi's death in 1957, and all the illustrations are done by students of Funakoshi, doing the Shotokan of that day. This means much larger or deeper stances etc. 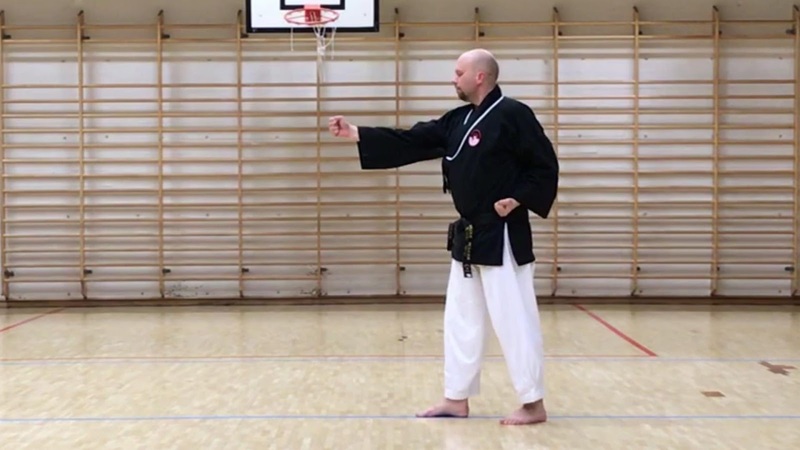 The hammer fist strike in movement #4 is here described as: "It should he [SIC] noted that the intent here is to free the wrist form an opponent's grasp following the block to the right and to attack his face or forearm" (Page 49). The elbow break using high section block is repeated here as well. The references to the hand on the hip that was so stressed throughout the 1935 edition however is gone completly. It would therefore seem that either Funakoshi or his students who finished the book started downplaying applications by 1958. 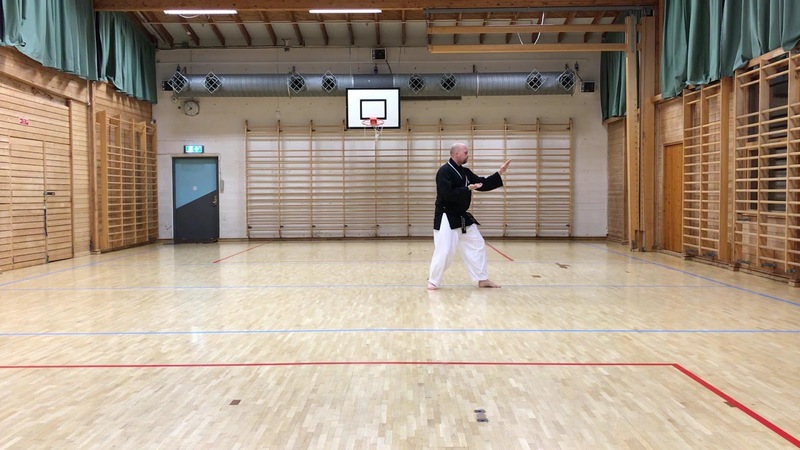 The book was never finished by Funakoshi, so it might have been as simple that Funakoshi hadn't been able to get the references within the book by the time of his death, and his students did the best they could with what they had. 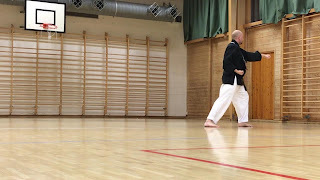 The following is my own interpretation of Gichin Funakoshi's works. The illustrations are from the film I made, and the descriptions accomponying the illustrations are mine. Any mistake is mine and mine alone, however this will give readers what I feel is a fair assessement of what the Kwan founders would have as their "base". 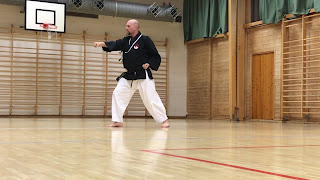 I know that any readers of a Mu Duk Kwan lineage will notice some differences between their version and this version. I will not go into them here, as I will revisit the form in an upcomming post and write how the Kwan(s) did it. Chumbi Seogi. Yoi is the Japanese term, and the way they do it is different than the modern Taekwondo Chumbi Seogi. 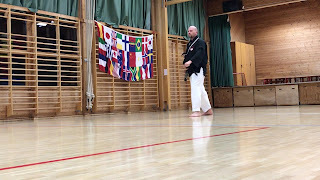 I chose to go with what I have always done, the Yoi or Karate version can be seen in the film I shared with the Shotokan Master earlier in this post. 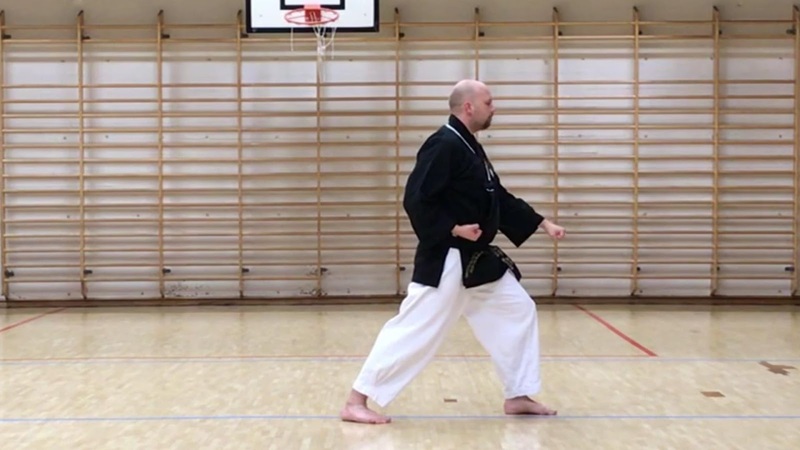 #1 Move to the left, long front stance and low block with left hand. 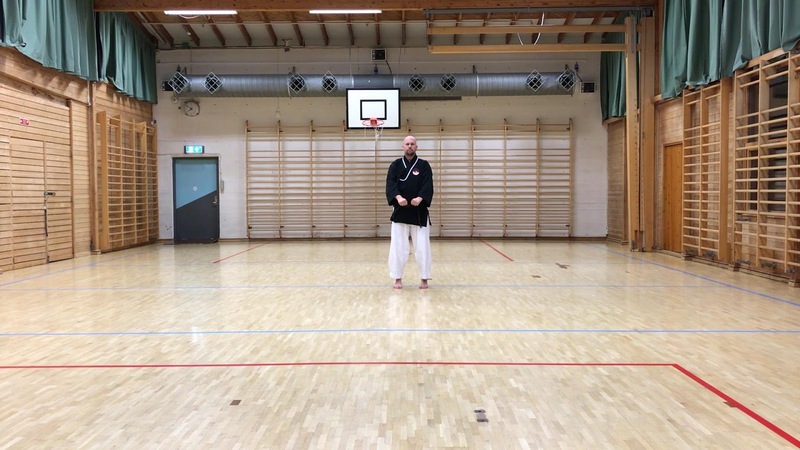 # 3 Pivot on your left leg 180 degrees toward your right into a right long front stance, and a right handed low block. 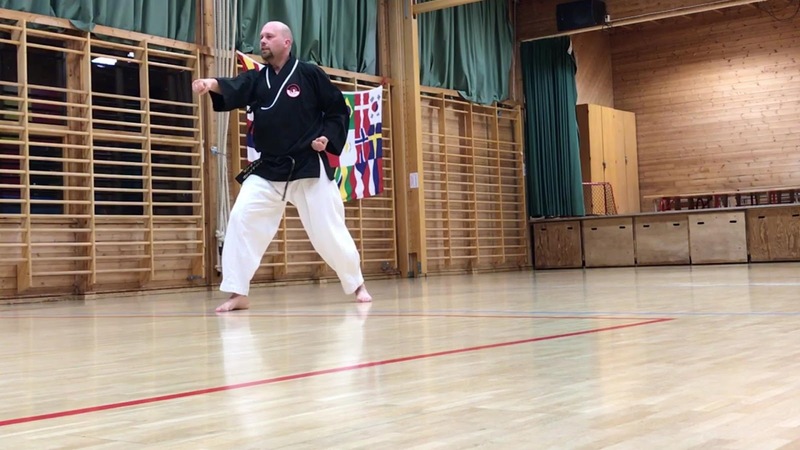 # 4 Withdraw your right leg toward your left leg into a shorter stance, and do a downward hammerfist strike with your right arm. 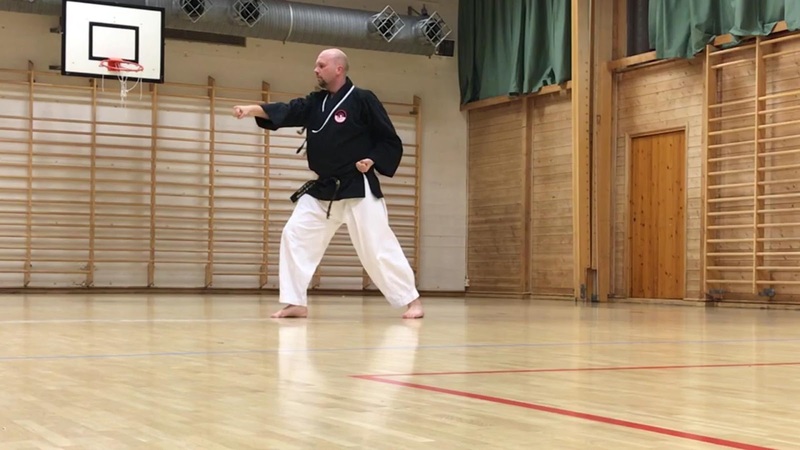 # 5 Move your left leg forward into a left long front stance and do a middle section punch with your left arm. # 6a Pivot on your right foot, 90 degrees to your left into long front stance and do a low section block with your left arm. 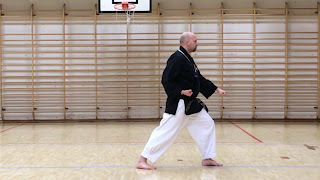 # 6b Feet remains the same, imidiatly after the low block is finished do a high section block with left arm. Move 6a and b is to be done as one movement. 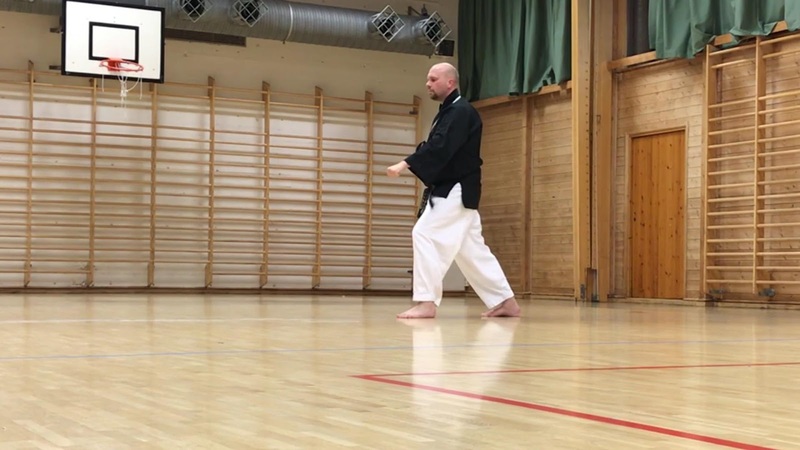 #11 Move right foot forward to right long front stance and do a midle section punch with right arm. 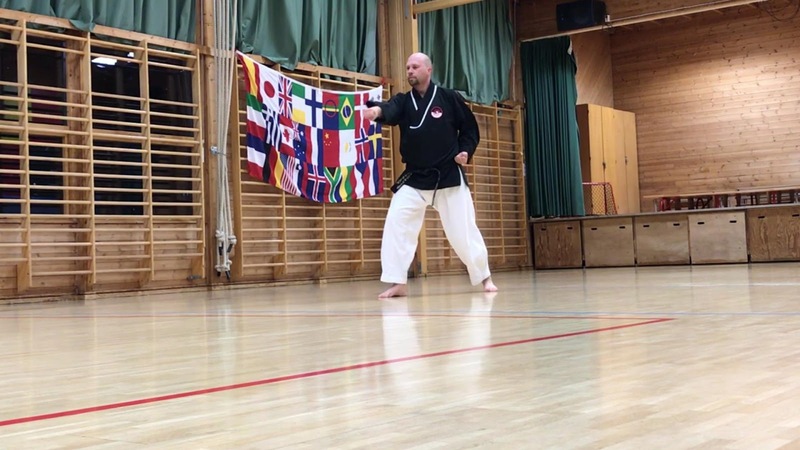 #12 Turn 180 degrees toward your right, pivoting on your left leg and go into a right long front stance and do a low section block with right arm. 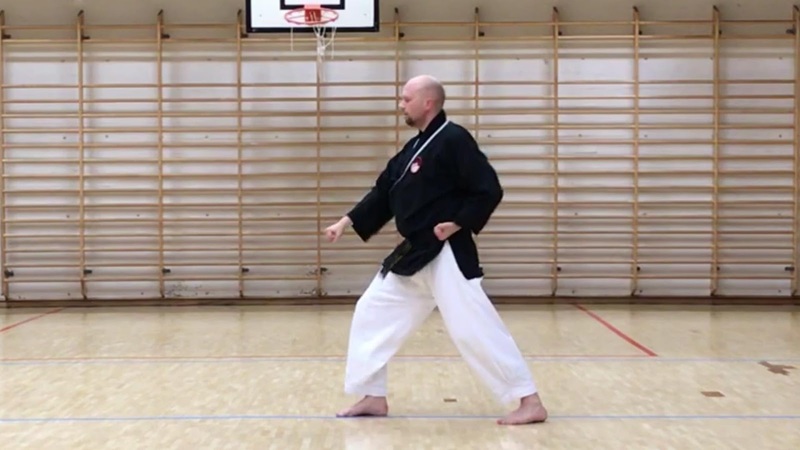 #13 Move left leg forward into long front stance and do a middle section punch with left arm. #14 (Angle is viewing from the back) Turn 90 degrees to the left, pivoting on your right leg, and move into a left long front stance and do a low section block with left arm. You are now facing the starting point. 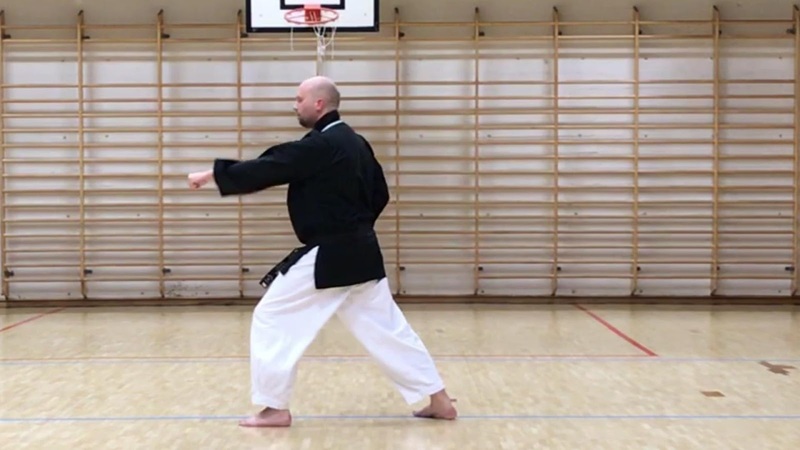 #17 Move right leg forward into long front stance and do a middle section punch. 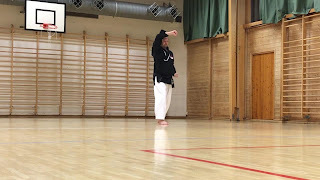 This is the second Kihap point in the form. 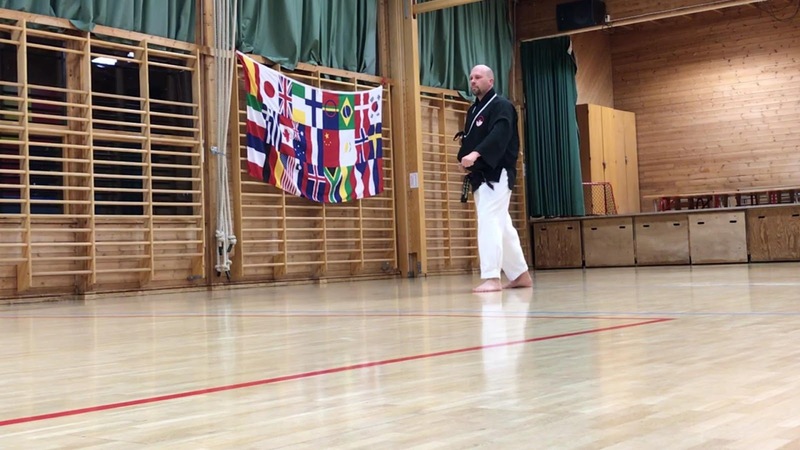 #18 Move 270 degrees clockwise, pivoting on your right leg so you end up in a right back stance (weight on right leg) and do a knife hand guarding block with left hand forward. #19 Move right leg forward at 45 degrees into a left back stance (weight on left leg) and do a knife hand guarding block with right arm forward. 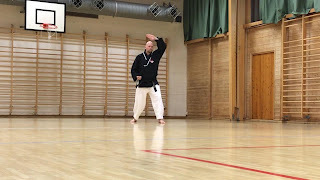 Withdraw your front leg back to form gibon chumbi seogi, or Yoi if your prefer. finally got a chance to complete this. History is so much fun, especially when trying to tease out why changes were made. This was the first form that i learned at GM Richard Chun's school. Of course, it was later dropped. 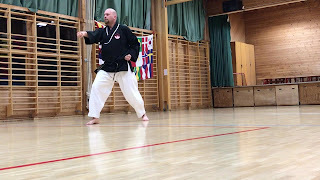 When i did this form at a Japanese school i was told that the series of 4 knife hand "blocks" (shuto renzuko (not sure of spelling)) was actually a series of throws. I thought Richard Chun kept teaching these forms, and didn’t know he dropped them:-/ I recently decided to include these in my own training and I find them very valuable :-) have you read all 3 parts so far? Fortunately, before his passing, he taught them to me. I was very honored that he selected me to work with him solo in fine tuning many forms including Yun Bee, Sip Soo, Jion, Chintae, the Chul-Ki series and others. Perhaps he knew what was coming. 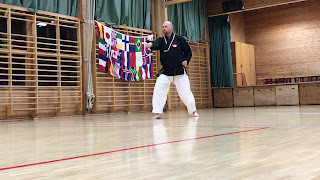 We met on many occasions going over the poomsae bit by bit with, believe it or not (and some would take exception with this), their applications as well. Moreover, for those truly devout in Moo Duk Kwan, see Grandmaster Hwang Kee's (our great-great grandfather) execution of the hyung Pyung-Ahn Cho Dan in his instructional guide for Orange Belt. 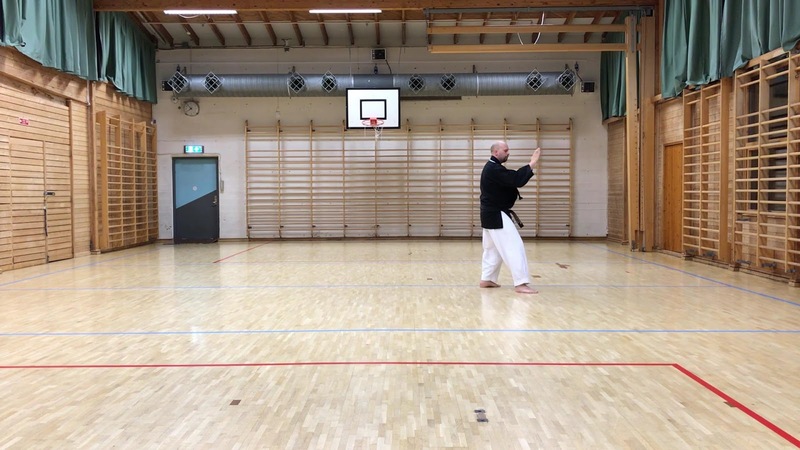 He is doing the four knife hand blocks at the low level. read all three. GM Chuns curriculum has so many forms that i think he had to let some go. 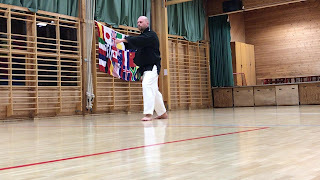 As i noted before, he kept all the MDK Shotokan based ones, the Taegeuk, Palgae, Yudanja, and a couple of other obscure ones. As i have confessed many times I find the older ones more satisfying and believe they have more depth. Perhaps this is just an old man picking his favorites. The Pyungahn series is growing on me :-P So I can understand why you like them more, having learned all of them from the start. I on the other hand "grew up" with the Taegeuk series. Interesting that you learned the knife hands on the end as a throw. Do or did they chamber them as we do in Taekwondo or did they do the Karate chamber? And did they do the middle section version as most do or did they do the low section as Mu Duk Kwan does? the knife hands were done in the old MDK way--rear hand palm down waist level,upper at opposite ear level, both move forward at same time. Not the single shuto commonly seen. 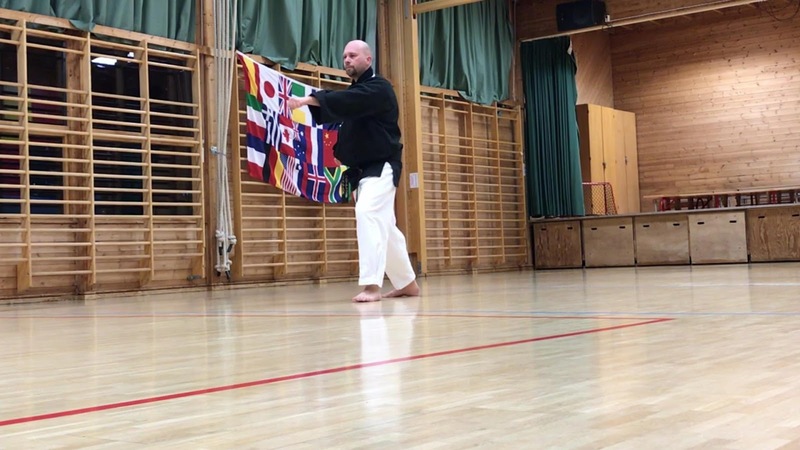 Honestly i still have seen much purpose to the way a lot of tkd does them with the rear hand carried so far back. haven't gotten a good explanation as to why either. Middle section was middle area not low. Did a workshop where they were doing the Pyungahn series with them low, felt strange, but doable. What really got to me was the weird kick chambers, made no sense to me. At this point i suppose i have to come to grips with the realization that i am at the point that i am willing to grab any concept that seems functional and fits what i conceive to be workable in the real world (without forgetting that there is always both complexity and artistry involved--meaning that some things take time and training to seem simple) I have learned much from the "internal arts", and the older "classical" versions of the arts that seem forgotten these days. Then again, i could just be another cranky senior citizen?